Considering investing in a pool this summer? Before you dive in, here are a few things to consider. What is your budget? This will determine whether you choose a pool style that will go above ground, on ground or in-ground. Depending on your family, lifestyle, and environment or landscape, the pool type you choose will differ. An above ground pool will cost somewhere between $3000 – $10,000 depending on the size and quality. 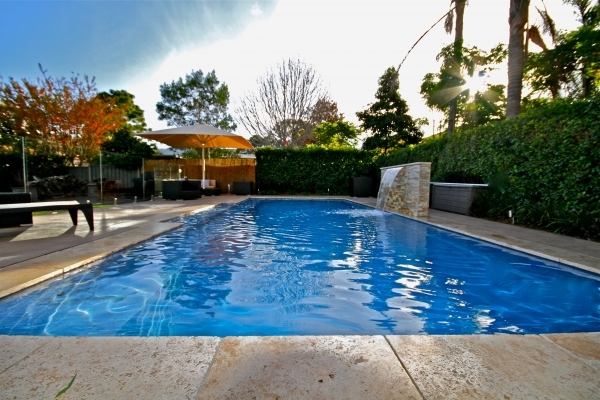 Above ground pools are generally for the family that doesn’t want to make too much of an investment but still want to enjoy the luxury of a pool. These types of pools allow you to have a pool even if you are thinking of moving in a few years and don’t want to invest heavily. That being said, there are a lot of above ground pools that can be made to look extremely nice with decking and landscaping. An on-ground pool, which is partially sunk into the ground, is usually between $15,000-$25,000. On-ground pools look like an in-ground pool, but they are usually built into a hill so the back side may be exposed, but can be landscaped to look like an in-ground pool. An in-ground pool will cost somewhere between $30,000 to $60,000 depending on size, quality, features and landscaping. The options with an in-ground are endless, the only limitation is your imagination. Homeowners are turning their backyards into mini resorts. No matter what type of pool you want, you can add many different features, such as patio furniture and hot tubs, to turn your backyard into a relaxing oasis. Instead of driving 5 hours to the cottage, why not invest in your backyard and enjoy it all week long instead of just on the weekends as you would with a cottage. After you have chosen the type, make sure you budget for fencing, electrical and gas hook-up. A permit is usually a requirement and this cost varies by municipality. Another requirement is that the pool water’s edge must have a setback of 4 to 5 feet from your property line although sometimes it’s considerably more, especially on corner lots and properties backing onto conservation land. Properties that back onto ravines, parks and rivers/streams also usually require conservation approval. Leisure Industries has been installing all three types of pools for almost 50 years. So whichever way you go, we can have you swimming in your very own pool in no time. Contact us today to learn more, and make your dream a reality.